Can A Truly Excellent Book on DD Be Written ? Books and articles about Doris Day. Although its great that DD is never forgotten and lately there has been a renewed interest in her work via quite a number of books being written about her--------these efforts appear to be missing the mark. As with everything else these days---there seems to be this 'need' for writers to approach their subject matter using a current 2010 perspective. That is all well and good when writing about something brand new---however, its the wrong approach for DD and anyone from her era. These current books about her tend to overanalyze and perhaps 'read too much' into her life and times---and especially what made her the 'star' which she became. Back then - people flocked to see her movies and to buy her records and would just kick back and enjoy her work. Period. I don't think many bothered with how she got from Point A to Point B in a particular song or movie role. They enjoyed her work in its totality ! Also I am not too convinced that her personal life had that much bearing on her actual work. She was basically an 'entertainer' and a highly skilled one at that. There is a need for a good book on her work but it would have to be written from someone truly in the know about music----the music from that era in which she vocally reigned------and of movies---------the films from her epoch. Something clear and easily comprehensible. There are any number of people in this forum who could provide such a book. A book that can celebrate her work and not yet another effort about why she does not visit Hollywood to nab a special Oscar or why she won't give interviews and other such trivialities that really have no significance to her work. Re: Can A Truly Excellent Book on DD Be Written ? I would say that 'Considering Doris Day' is the nearest book to this idea/ ilk. I thought at first it might be but the writer was perhaps too highly critical of DD's early movie career at WB. Were it not for her years at WB - she certainly would not have become better known before the public at that time and during those years. Besides those WB films are very entertaining and people back then obviously must have enjoyed them otherwise Jack Warner would have dropped DD and would have put an end to her movie career. WB was the perfect stepping stone for her. Eventually she was able to 'move on' with the LOVE ME OR LEAVE ME, MAN WHO KNEW TOO MUCH, and the others so WB was a nice introductory progression for her film career. At WB she got to work with some very talented people and was able to return to dancing in addition to her singing and also hone her acting skills. At WB she had great directors such as Curtiz. She had a superlative singing partner in Gordon MacRae. She got to work with major character actors such as SZ Sakall, Eve Arden, Billy DeWolfe (who became a friend of hers) - and she even got to work with her childhood idol - Ginger Rogers. The writer of this book is trying to look at her career through a 2010 lense and this is impossible to do. He also criticizes her novelty tunes but those 'ditties' were very commonplace as well as very popular during that era. All the major singers had their share of novelties, too ! OK - they were not 'great songs' by any means but they did sell copies and I frankly rather listen to them as opposed to all this 'rap crap' and 'hip hop' and loud music enough to give me several migraines ! I don't think it a good idea for writers to try to 'read' too much into her career because she was very much professionally a major part of her particular era. Even before her film career began --- her first HIT - 'Sentimental Journey' was very much a part of WW2 and the song 'spoke' to many going through that time. We are in very tough times now------truly nightmarish---but we do not have such significant songs or movies to bolster the spirit and help us to forgot all our troubles such as those early WB 'flicks' must have done. Too many 'modern' writers seem to forget these very important facts when writing about DD. To truly capture what really helped to bring her enormous talent to the masses of that time----one has to be able to deal with the era and its tastes and styles in both music and movies to provide a truly meaningful book about DD. She was in fact (during her professional years) a representation and embodiment of her era. Her vast achievements came to fruition back then---and not in 2010. I think such books for the most part are subjective by their very nature. However, I believe this book [for the most part] gives Doris proper due regard for her amazing talents and amazing career: there is no doubt about that. While there are opinions in the book I do not agree on [his view on Pillow Talk comes to mind] - there is no doubt Kauffman helps put D Day where she should be in the history of entertainment. He gives Doris glowing endorsements on films such as 'I'll see you in my dreams'; 'Love me...'; 'Man who knew too much'; 'Teacher's Pet'; 'Pajama Game';'Daisies and 'Thrill of it all...' to name many. Although he criticises novelty tunes, Kauffman waxes lyrical about the vast majority of Doris' concept albums [and rightly so]. Also, while I appreciate the times were very different when Doris was making her WB films: the fact is, although the most of these films are highly entertaining: they are not great films, what makes them remotely great today is the talent of the wonderful Miss Day. Let's face it - when it came to movie musicals - few studios could hold a candle to MGM. WB made some musicals before DD-------Yankee Doodle Dandy, Hollywood Canteen---spring to mind but the bulk of the truly great ones came from MGM. 20 th Century Fox was fortunate to have Betty Grable, Alice Faye, Carmen Miranda and others that lent excellence to those musicals much as Doris was to do for WB. MGM seemed to have the budgets to produce spectacular results plus better production teams so that their musicals were unparalled in movie history and their list of titles that became classics is indeed staggering. WB could never match that record. WB was primarily a studio capable of turning out great dramas and for many years ---- those gritty 'film noirs' became their stock in trade. Then Doris came along so then WB had to jump on the musical bandwagon. True she brought everything to these films but she did get to work with some fine people there--both onscreen and off-----and she was able to polish and hone her craft so when she finally moved on from WB------she was able to segue into far more substantial projects----LOVE ME OR LEAVE ME, MAN WHO KNEW TOO MUCH where she finally worked with a 'biggie' director in Hitchcock so WB was for her ACTING 101-----'On The Job Training' and therefore a means to an end. Yet the WB years were not without their highlights in her career. In fact her very favorite role - CALAMITY JANE - was from WB and this was the film she truly likes the best of all the ones she did. So at least WB did a few things 'right' in her case ! Young at Heart - I adore this film and think it gets an unfair press today, it looks wonderful and has Day and Sinatra- who could ask for more? I agree with your choices ! I also thought LULLABY OF BROADWAY was quite good---a film in which Doris was able to dance up a storm and the supporting cast was quite good. STARLIFT is a film that's been growing on me. Though Doris' role there - as herself - was quite small (I wish they would have built it up just a bit !) she was in excellent voice in all the songs she sang there and was simply fun to watch. I sort have a 'soft spot' for WEST POINT STORY as I also happened to like Virginia Mayo. True the Doris role was more of a supporting one but she still had some fine moments there as well. MY DREAM IS YOURS is a highly overlooked film----fine performance from Doris there. I'm glad you included "I'll See You In My Dreams," Jas. I think it's an underrated gem! Love it! And TCM, I agree about "My Dream is Yours," another favorite of mine - I think I like it better than "Romance on the High Seas." That number Doris does with her little boy at bedtime ... have you ever seen two such beautiful faces together like that? Takes my breath away! And the song is wonderful ... "I'll String Along With You." howard wrote: I'm glad you included "I'll See You In My Dreams," Jas. I think it's an underrated gem! Love it! And TCM, I agree about "My Dream is Yours," another favorite of mine - I think I like it better than "Romance on the High Seas." That number Doris does with her little boy at bedtime ... have you ever seen two such beautiful faces together like that? Takes my breath away! And the song is wonderful ... "I'll String Along With You." Indeed ! What I also liked about MY DREAM IS YOURS are the rich contributions from the character actors----Arden, Sakall, Menjou, Royle, Kennedy, Sheldon Leonard, Pangborn, et al. All these people added to the overall tapestry of this film along with the excellent starring cast. The Harry Warren tunes are fantastic ! We was one of the most underrated of composers of Pop Standards---extremely prolific with many HITS to his credit and some Oscars to boot --- but his name escapes far too many. 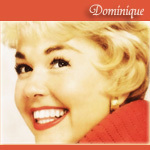 The best DD books in my opinion are Doris Day My Story/ Considering Doris / The Untold Story of the Girl Next Door. I wish someone would just write a book about her music and what she went through when it came to recording. I find all of that very fascinating. I agree Dominique- that book is overdue and would be fascinating! Yes, I would love that kind of book with complete recordings and live performances information with all details and comments from Doris and other people, who worked with her. If that book will not be written now, while many people and Doris are still alive, I'm afraid it will be to late. I wonder, where is all recorded material of shows - DD shows and Bob Hope shows she made two years and others, she was guest in. They are not available for buying anywhere. I almost every day check the sites and now and then find some. Unfortunately many shows are not correct titled and are only copies of other shows. I find out that after receiving the ordered CDs. So I was disappointed many times. Thanks to Peter we have the best list of songs, shows and live performances. If it wouldn't exist, I wouldn't know what to look for. Thank you, Peter! Thank you, Mike! Your Sentimental journey is a treasure box full of information. You could write a book and I'll be the first buyer. Thank you, Bryan! Without your beautiful dorisday.net and other your sites I wouldn't know much of our beloved Doris. Thank you Nada...you are the second person who said I should put my scripts into book format and then you would have a discography. I was under the impression that John M was doing the definitive discography..but no word from him in months..so I guess that is not happening. I do not consider myself a real authority...too many things I do not have in my collection and like you, i have no where to find them. Peter Flapper has the best listing of her work thus far. I have to admit that I am happy with the way the SENTIMENTAL JOURNEY shows on Frednet worked out. When put together, we have a recorded archive of her works (pretty much most of them that are available and a few rarities). I will be happy to know that the recorded history in those shows will be left behind in the Frednet archives long after Doris and I are both gone. And I am happy to have done my small part in keeping Doris and her music alive. Thank you for your compliments. It was great to do, and I hope to make the lists a lot longer in the future. But than I need new songs/shows to put on them. Through this website I got the idea to make the songlist and later the showlist. So we have to thank Bryan for that I think. Even Sinatra had a novelty tune released with tv personality, Dagmar. Who could ever forget "Mama Will Bark.?" (lol). I honestly doubt that anyone could write the definitive book, in and of itself. There are many that are good for various reasons. The "Sentimental Journey" shows (originally produced on Frednet) were my small part to add to the field. But that is a musical (and not a written) journey. As such, it would have to be a "recorded biography" and it would be extremely expensive to produce. Frednet no longer has any of those shows. I have them all on a flash drive, and I have the original scripts, and the music. The material is there; it would take someone with a lot of money and rights to all the music to put it in a buyable format. Sorry...not me. That said, I am currently working on a book of sorts that develops the impact that Doris had on my life. I hope to have it completed for Christmas. Whether or not it will ever be published...I am not sure. I intend to make it a Christmas Present for that special someone. I'm a big fan of the group ABBA and there have been some amazing books on them. My favourite is ABBA:Treasures which contains reproductions of old merchandise and gorgeous pictures. Also, 'ABBA The Scrapbook' is another lovely little book. I wish they would make something this for Doris with pics on every page, old Doris merch reproductions (colouring books, paper doll books etc) and so much information and HQ pics on every page (maybe even a poster!). I don't see why not, she is still extremely popular and still has many fans from young to old. Just the thing is, no one wants to make one. She may not sing or act anymore but I'm people are still in demand for Doris stuff and she still has so much love towards her. I'm sure if they made a weekly/monthly Doris magazine (like they did for Elvis) it would sell very well. Even some free cute gifts would be super sweet. It makes me sad that she is so popular but no one makes any cute merch or anything really nice of her. I would love to go to the store one day and pick up a Doris magazine or a new book by Doris herself or even a book of pics of things her fans have given her. Even a Hallmark greeting card that opens up and says in Doris' voice one of her lines in a movie would be really cute and I would buy it without question! The only thing I see of her on ebay for 'today' are CDS put together from unknown companies just tossing random songs of hers on a compliation and calling it something like 'Simply Doris Day' 'The Day Compilation' etc etc. I have countless Doris compilations and most are just songs you find on other albums. The recent album she helped put together I won was great because she chose the songs herself, but that is the best one I've seen in ages. If I had the skills to put a book or magazine together, I would but I wouldn't know where to start. A huge book all about her and all her movies with HQ (High Quality) pics and info all accurate would be truly amazing. I mean, there are enough books out there of Doris but which ones are truly accurate, helpful and you can use like a dictionary? One book (that is actually critisized by fans of ABBA) is called 'The Complete ABBA'. Even though it makes errors, it is quite informative. Another one is 'ABBA the book' which is extremely informative, huge and has amazing pictures. Another book I own (not of ABBA) is called 'The Bionic Book' of the two shows 'The Bionic Woman' and 'The Six Million Dollar Man'. It may not have colour pics but the information it provides is extremely helpful and you learn so much. I know this is unrelated to Doris..technically..but I'm just referencing what a good Doris book should be. I long for the day (no pun intended) I go down to Whitcoulls and I see that Doris magazine lying there, would be a dream come true! A book is "in the works". I will let you know when it is published and where you can obtain it, if you are interested. Keep tuned! oooh really? Is it like anything I would like in a Doris book? Becky:oooh really? Is it like anything I would like in a Doris book? or even go to the URL SEARCH BAR. type in DORIS DAY and click IMAGES. Yes, please do. I would be interested. I am re-reading Mary Anne's book "Day at a Time" by Hawthorne Publishing, which details her life with Doris from around 1967 to 1974. Since I was there at the beginning of her adventures, it brings back fond memories. There are many never before seen photos also. Mike- the book sounds great, can't wait. There really has not been a satisfying book about Doris since her own book. And that was a run away best seller! Doris was number one again in 1976 with her book!